Grier School | Congrats, Grier Class of 2018! Congrats, Grier Class of 2018! 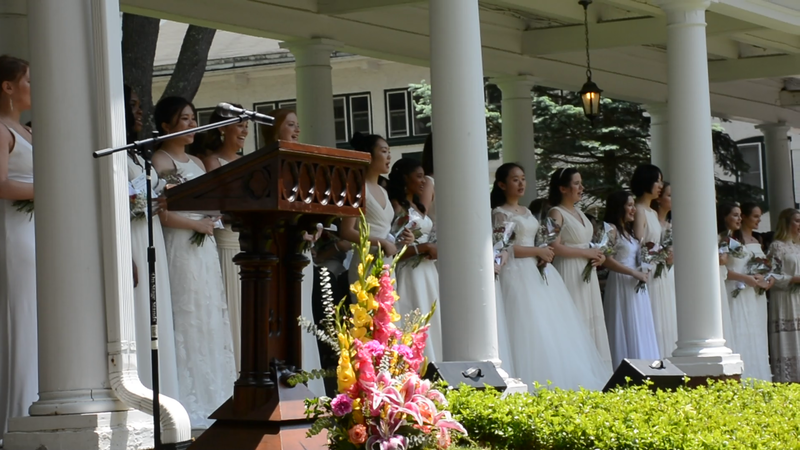 After days of special events and celebrations for Seniors, things culminated, of course, with the Graduation Ceremony on Lodge Lawn Saturday afternoon. 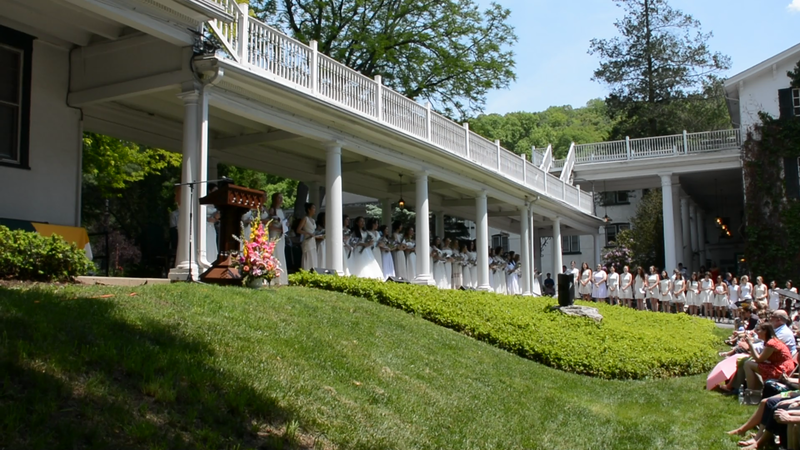 Junior class servers attended the graduating seniors who proceeded down the Colonnade in their long white gowns. Director Dr. Douglas Grier welcomed everyone. 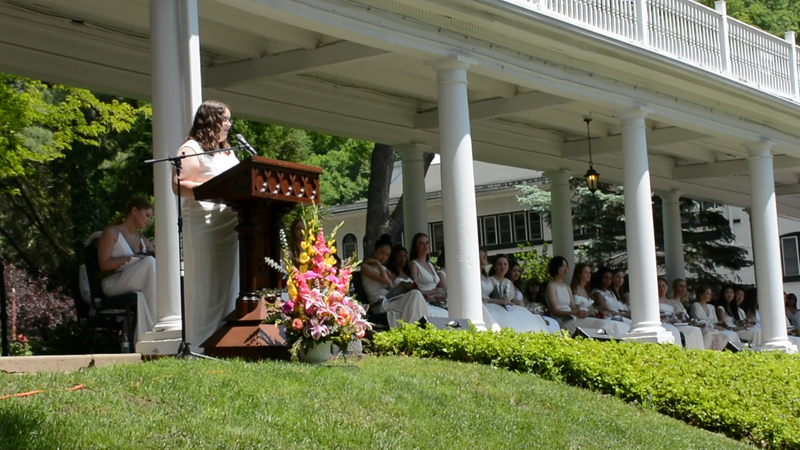 Senior members of the National Honor Society gave speeches, along with the valedictorian Karin C. Head of School, Mrs. Gina Borst presented senior awards and, along with Dr. Grier, the diplomas. Mrs. Harriet Grier welcomed the new Alumnae and Student Council closed with a prayer before everyone sang Grier's Alma Mater. 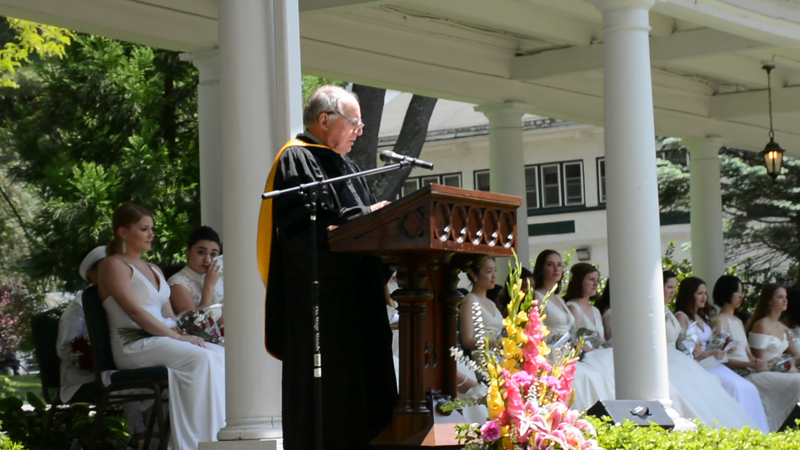 NHS students who gave speeches at Commencement included: Olivia A., Cas C., Mary D., Jaden H., Betselot L., Grace L., Tess M., Katherine S., Teresa W., Grace W., and Irene Z.
Grier Administrators express thanks to parents, family, and friends for all their love and support. Thank you for sharing this special day! Congratulations to the Grier Class of 2018! 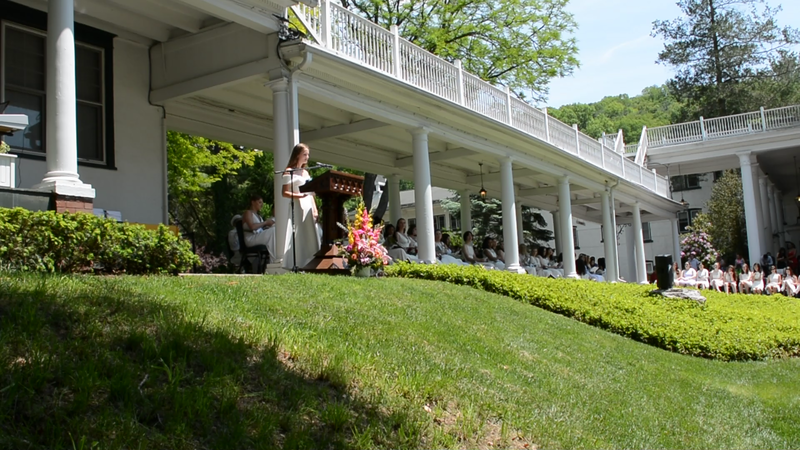 Commencement Speech - Cas C.
Commencement Speech - Jaden H.
Commencement Speech - Grace L.
Commencement Speech - Katie S.
Commencement Speech - Grace W.
Graduates lined up in white gowns. Feeling the emotions of the day. Olivia A. spoke of soaring with her pilot's license and soaring at Grier. Cas C. related how she had made a name for herself here at Grier, despite the long shadow of her acoomplished older sister. Mary D. talked about all she loved at Grier and referenced the Sound of Silence..
Mrs. Gina Borst, Head of School awards Honors and Prizes. 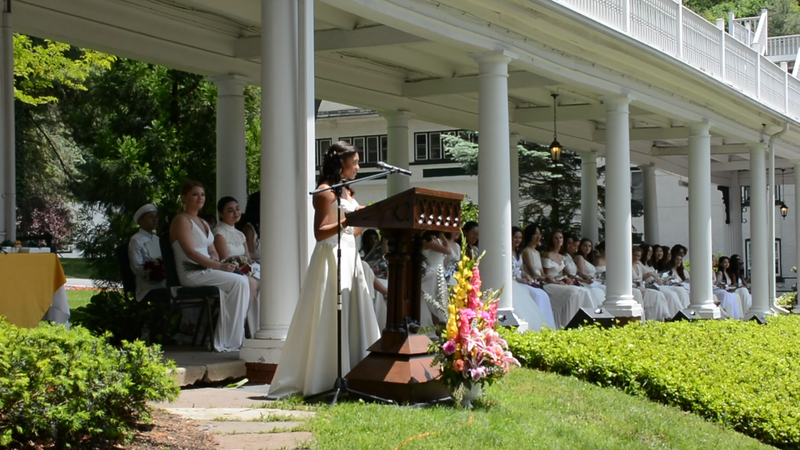 Jaden H. delivers a commencement speech. Betselot gives a speech about what Grier means to her. 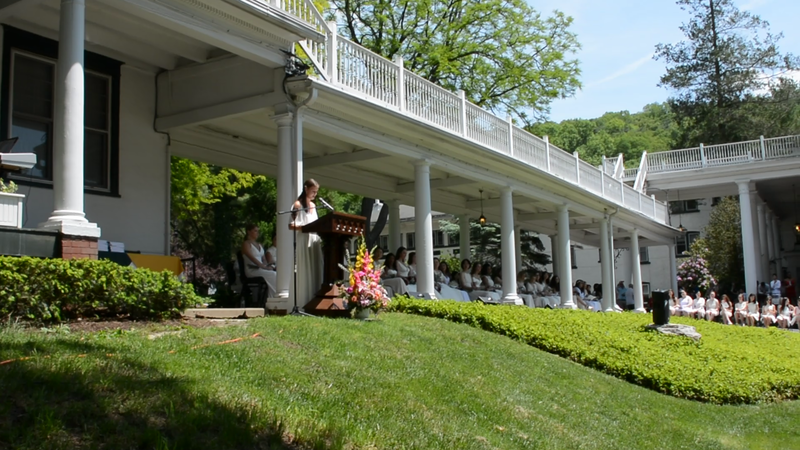 Grace L. speaks during the Commencement Ceremony. Tess M. gives a speech before the presentation of diplomas. Betselot gazes toward the crowd. Teresa W. gives her speech. 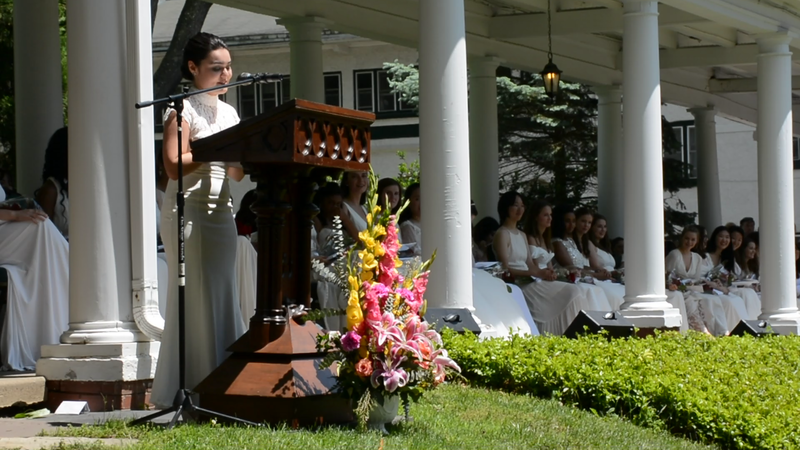 Grace W. lovingly remembers her father, the late Head of Grier School and her journey. Director of Development, Mrs. Harriet Grierl. welcomes the new Grier Alumnae! Sara H, Student Council President and the officers Katie S., Kaliyah M., and Teresa W. lead the prayer. Mrs. Cari Crago and Mrs. Borst. Groups like these servers gather for photos after the ceremony. A family portrait with two Grier alumnae: Cathy and Cas! Grace W. and her family.